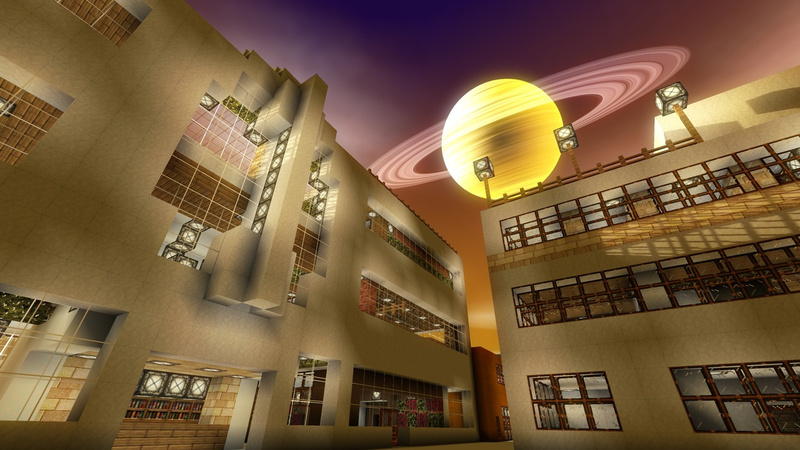 When Minecraft took the world by storm and functionally created a new ‘sandbox’ genre, it stood to reason that there would be plenty of games which would try to muscle in and get a slice of the pie. Some of these games, like Dragon Quest Builders, had something to add to the formula which helped them carve out a niche while expanding the genre’s boundaries. Other games, like Discovery, went the route of directly aping Minecraft’s gameplay, in hopes of snatching up those who didn’t want to pony up the cash for the full experience. Discovery is simultaneously a perfectly fine and perfectly forgettable experience, doing a good enough job of adequately executing the few ideas it copies, while bringing absolutely none of its own original ideas. Gameplay in Discovery closely matches that of Minecraft to the point that there’s hardly any distinguishing characteristics, which may be a good or bad thing depending on how you view it. 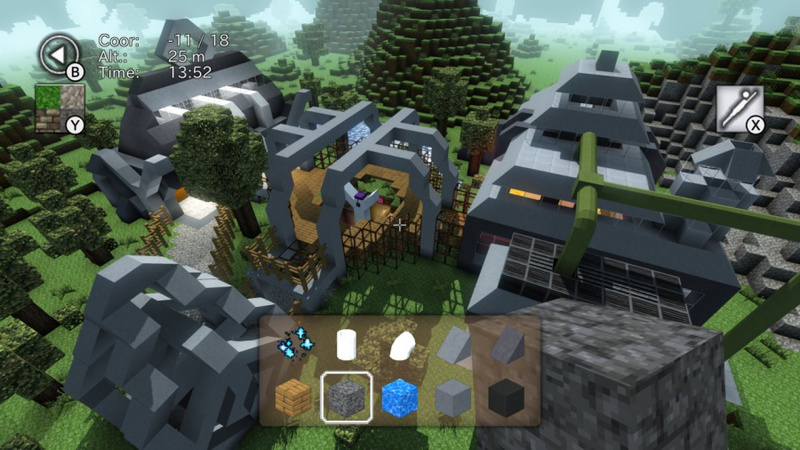 You view the blockish world through a first-person perspective, blocks can be created or destroyed at the tap of a button, and you can even choose to fly if walking becomes too cumbersome. There are no survival elements to speak of; no health bars, enemies, crafting systems, or anything that would come with that territory. Instead, Discovery is focused solely on creativity, giving players all the tools and tilesets that they need to build whatever they can dream up. To this end, Discovery does a great job of serving the players needs. Up to ten items can be set in your quick menu, and controls are intuitive and simple. World sizes don’t feel cramped, giving you plenty of room to work with, and the draw distances in docked or undocked mode aren’t too much shorter than those of Minecraft. There are over 250 different block types to work with and some of the materials even have a degree of interactivity, such as wire that can be set to turn on lanterns with a switch. All of the elements are in place for those of you that wish to play with virtual LEGOs, so to speak, but this is where the biggest drawback of Discovery comes in. No matter how you slice it, it’s hard to get away from the fact that the no-frills mantra of Discovery makes for an experience that feels like it’s constantly riding the coattails of its much more mechanically developed inspiration. Ultimately, it’s just a large collection of useless, differently colored blocks that you can stack together in whatever way you like. For some, this is the main draw of Minecraft, so it’s not necessarily a complete negative, but we feel it’s important to stress that there’s really nothing else to this game. The environments, though vast and diverse, feel lifeless and empty when there’s nothing to do, and there are only a few basic mobs to populate them. Your enjoyment will purely depend on how deep your own creative ambitions are; there’s a complete lack of incentives to give you a reason to come back to this one. Graphics are about what you would expect, and while they may not necessarily wow, they don’t disappoint either. Textures aren’t as detailed as those that you would find in Minecraft, but they don’t look cheap, and only really show their lack of intricate detail if you take the time to scrutinise that sort of thing. Animations leave much to be desired; the tame creatures you can spawn or stumble upon, such as mountain goats, move in a stilted, wooden fashion that is neither convincing nor charming. Features like sunbeams reflecting off of the surface of water and fog that obscures distant mountains help to imbue some life and detail into the otherwise bland world, and these each can be toggled on or off if you’d like to prioritise performance over looks, though frame rates almost always ran at what seemed to be a smooth 30fps. Discovery is that kind of 'meh' game that leans a little hard on unoriginal ideas. 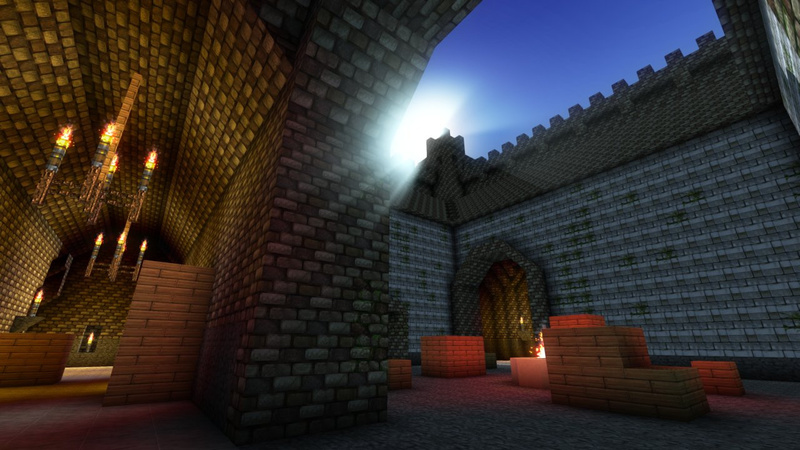 It’s not that there isn’t room for more games in the sandbox genre that Minecraft pioneered, but these games need to bring something fresh or innovative to the table if they are to stand a chance of forging their own identity. 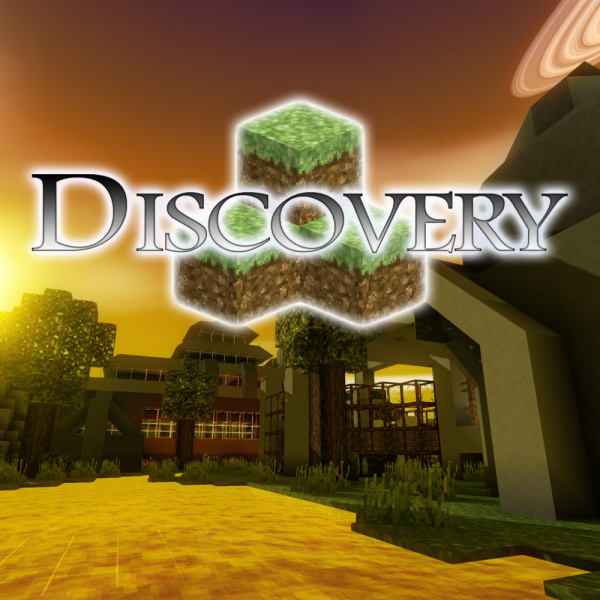 As it stands, Discovery is Minecraft, but with fewer polished mechanics, no survival mode, and fewer blocks to use, and slightly less impressive graphics. It’s not a bad game by any means, but there’s nothing here that Minecraft doesn’t already do much better. If you’re only interested in the creative mode, and you don’t mind giving up some bells and whistles, this is a decent alternative for those of you that are looking to save a few bucks, but otherwise, you’re not missing out on anything significant if you choose to pass. I will never play, nor buy this game. But that header picture has given me a new epoch of joy that I will appreciate for years to come. Thank you Discovery! I rather continue playing Dragon Quest Builders. I enjoyed it on the Wii U. I still might pick it up again. Out of all the games they can review, they choose this obvious half-assed Minecraft clone? @JayJ Agreed. Not sure why Nintendo Life so often chooses to highlight the garbage in the Switch's library and not the actually good stuff. @KirbyTheVampire Perhaps the developer gave them a key. Or maybe they knew money conscious parents would be looking for a Minecraft clone on the cheap. I bought UCraft on Wii U (another Minecraft knockoff) and it wasn't bad. It did have a survival mode and offered several different block types not found in Minecraft. But ultimately the gameplay wasn't refined as Minecraft so it quickly lost interest in our house. We still play actual Minecraft on Switch to this day. "Jumping Jellyfish, what's that STENCH?" Impressive graphics is not something I've heard used to describe Minecraft . Reviewing bad games is important too--if for no other reason than to help buyers make smart purchases and resist supporting unimaginative garbage. Portal Knights with update version 1.4.4. (Steam version first, Console version later) has MUCH Better features in Creative Mode rather than that game above (Discovery). So many Minecraft clones. and the bad ones aren't even trying. Fell in love with the header image as soon as I saw it in the eShop. It's like Minecraft mashed with RuneScape NPCs (this is not a compliment, needless to say). Good title to scroll past in the eShop when searching for better games. @JayJ Well, we can't score every game an 8. To be fair, this one had some promise, but it turned out to just be an "eh". That reminds me, are you gonna review the new Minecraft version for Switch? Meh, if they're bringing a "Minecraft clone", might as well bring in a good one: Terraria or Starbound. Especially with crossplay. @Varkster yes, Minecraft is the most popular but at least get your facts correct. Everything is essentially a clone and so is Minecraft. Have you even played Discovery on any platform? I personally recommend you do. Especially on PS VR. It's something else!! I played the Wii U demo and thought it's nice that this game doesn't add just blocks but slopes as well. Makes for much nicer buildings. Still, I'd get Minecraft, Dragon Quest Builders, and Portal Knights before Discovery because they're all more advanced and different enough from each other.